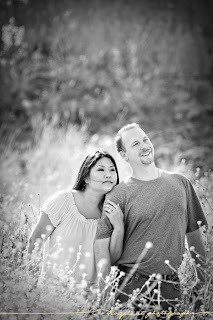 Moira Taylor: Amy & Larry Engagement Shoot! Amy & Larry Engagement Shoot! Amy of The Relentless Bride had contacted me after she saw that my sister had twittered about my graduation from Studio Makeup Academy. (Follow me!) After corresponding by numerous emails and texts I was so thrilled to finally meet her in "real life." She is just about the cutest thing ever and I was excited to follow her and Larry on their engagement shoot to the sunny fields of Calabasas and the gorgeous beaches of Malibu (even though it was freezzzzzing!) Amy was going for a "naturally dramatic" look and I believe that the final result was fantastic! You can check out more of the photos HERE! !